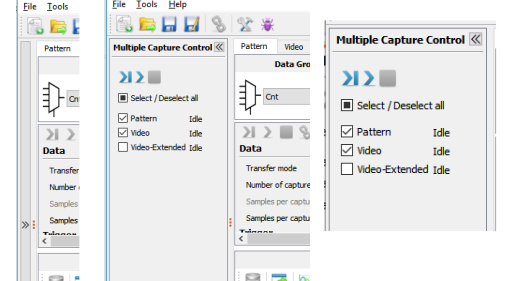 – Open the ‘Multiple Capture Units Control’ pane (click on the double arrow on the left of the window if it is hidden). – Select the capture units that you’d like to run together by selecting the tick box in front of their name. – Use the capture controls from this pane. When ‘Run’ or ‘Run with trigger’ is pressed, the selected units will capture data according to the settings defined for each of them separately. Please note: running more capture units requires more bandwidth on the transceiver links. Even if a single capture unit runs without creating an overflow condition, enabling additional units can create overflows. Please click here to read more about overflows.